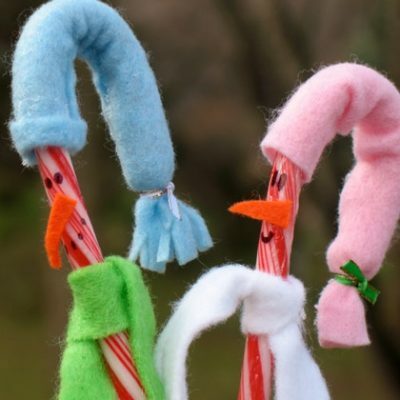 Dress up your candy canes as cute little snowmen. This is easy to do and requires minimal supplies, making it a great classroom project. You can add a brim to the hat by rolling the felt up. Cut a piece of felt about 2″ wide and 5″ long. Using the long stem of the wrapped candy cane as a guide, glue a sleeve of felt around the candy cane. You want to create a felt tube that the candy cane with slide through. Slide the felt tube up the length of the candy cane and onto the curve, leaving most of the straight part exposed. Feel the felt and find where the curve in the candy cane ends. Tie a piece of ribbon or yarn around the felt just after the end of the candy cane’s curve. Fringe the end of the felt below the ribbon by making long slits with your scissors. Trim the excess for the hat’s pom-pom.